Okay, so another batch of chaos has now left my life - some of it is bound to return, while some of it left permanently. This second group can be divided into a "fortunately" and "sadly" section. People have left my life whom I'm sad to see go, and others whose back I couldn't wait to see, preferably while holding my biggest, sharpest kitchen knife. There have also been friends visiting, things moved and similar stuff which, adding up, pushed me into performing some re-claiming rituals around my house and my home. I think everyone feels the need to have a space of their own, no matter their spiritual practices, but I also think we kitchen witches feel it more than other people. Our kitchen, our hearth, our space is an extension of our soul, not just a place where we do things. Having someone intrude on it is therefore a nasty, slimy feeling that lays similarly on the soul that a layer of something sticky and filthy lays on the skin. With someone actually, physically - and very aggressively - intruding on my space, I really did feel the need for a thorough scrub, not just in the material sense. I started, however, with just that - with cleaning. I've made it my rule some time ago that I do not practice the craft in dirty spaces. Some witches raise a protective circle or surround themselves with sigils; I mop the floor and scrub the countertops, because how can a cleansing ritual work if you're unclean yourself? Not only does this help to remove physical signs of any intrusion onto your space, but the actual wiping them off is, at the same time, a symbolic gesture, not only of removing the unwanted influence from your space, but also of reclaiming it as your own. After all, while others may stomp over your place and leave greasy fingermarks on, it is you who's caring for it. Tending it. So if you feel like performing such rituals and are in need of ideas, here's what I advise. Firstly, I air all the rooms thoroughly, to clean the space itself. While all the windows are open, I tidy up, starting with anything that may have been misplaced against my wishes (when I say intrusion, I mean it), but not stopping there: arranging the house neatly helps with cleaning and gives it a "new" ambiance. It also underlines the fact that I am in control. So all the clothes, all the stuff scattered everywhere should be put in its proper place, all that dry washing taken down, all the dishes tidied away from the sink. Ready the house as if the in-laws were coming; after all, you deserve at least as nice a space as the in-laws. 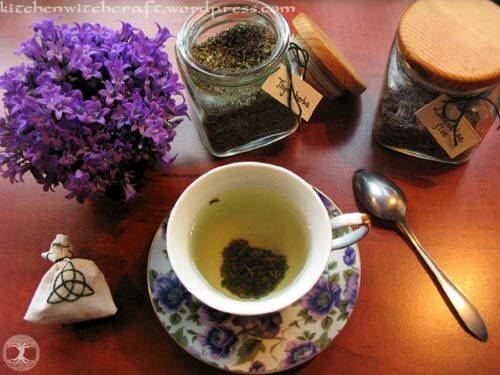 I then use a protective, cleaning herbal infusion to wash the surfaces with, which cleans up nicely, smells amazing, and makes away with any "spiritual residue" - any malice left behind. Completing this step really brings definite improvement to the ambiance of the house. I try to do away with as much dust as possible, but the actual amount depends on the time I have. Cleaning everything would take weeks. Next, I light a small candle in every room, preferably a white candle to symbolise cleanliness and peace. (But I've also done it once with varying colours I had handy, and this also brings the satisfaction of being frugal and sensible.) With the candles burning in each room, I passed through all of them with a smoking incense stick in my left hand and a bundle of dry sage leaves in my right hand. In each room, I burned one sage leaf in the candle and proclaimed the space as mine. I planned for the bathroom to be the last piece I visited, so that immediately I could pass on to taking a bath, a cleansing ritual of even more personal nature. Add some calming herbal tea, and I was quite amazed myself at how much better I felt. I strongly advise such claiming (and re-claiming) rituals to all you witches who need a bit more balance and control in your lives, to all of you who want peace and who want to feel they belong. And, of course, to any of you who had to suffer an intrusion into your space, though I hope most of you didn't. Equal parts of everything, infused like tea. Cool off a bit before using. Thank you so much for this. I had a visit from family members I really don't consider family no more, and this is just what I need. I need this, my whole household has been rather negative lately, first to clean and organize, then to smudge and eventually, relax once again! I just got rid of a bevy of ungrateful houseguests who took over my new house and I really want to reclaim my space.